A similar getaway to the New Mexico desert produced material for Worry the Jury, Madviolet’s 2004 debut album. As they did then, they took their Byron Bay tunes and a few rewrites completed with Ron Sexsmith to producer and friend John Reynolds (Sinead O’Connor, U2) in London, England. Unlike the pop-oriented, sumptuously produced Worry the Jury, the mission this time was to capture Madviolet’s live personality and musical roots. The result is a smart, richly melodic singer-songwriter album where contemporary alt.country rubs up against confessional ballads, roadhouse rockers, Lisa’s Cape Breton fiddle playing and even a streak of old-school Nashville that would do Brenley’s namesake, Brenda Lee, proud. Keeping overdubs to a minimum and steering clear of programming, MacEachern and MacIsaac trade lead vocals, layer on the harmonies and drive the songs forward with acoustic guitars and fiddle, just as they do when performing live. Reynolds (drums) and bassist Claire Kenny (Indigo Girls, Damien Dempsey) again anchor the sound. Julian Wilson of the acclaimed U.K. alt.country band Grand Drive plays piano and Hammond organ. Joining this core group at strategic points are lap steel guitarist Simon Alpin (Willard Grant Conspiracy, Teenage Fanclub), dobro player Fiachna Braonain (Hothouse Flowers, Michelle Shocked) and classical guitarist Hugh Segat. 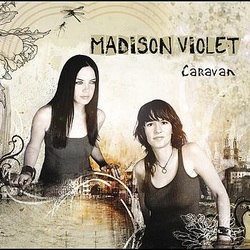 Above all, Caravan captures Madviolet’s growing confidence as a songwriting and performing partnership. “Every band needs time to grow into its true self,” says Brenley. “We now have a better sense of what we can accomplish together.” Instead of recording their vocals separately as they’ve done in the past, the two sang face-to-face in a process that facilitated their gift for intuitive harmonies. Brenley again handles the majority of lead vocals, including Way Past the Hour, Skylight and I Am An Only. But now the two Libras (both born on Wednesdays in October at noon precisely) have balanced the creative scales more evenly. Lisa sings three songs, including Prayed, a vivid take on spirituality that arrived in a bolt of middle-of-the-night inspiration. And after focusing on guitar in recent years, she again steps forward as a fiddle player in the MacIsaac family tradition. Her extended solo brings Caravan to a riotous close on “Never Saw the Ending,” which itself ends with a shouted “yee-haw” from Reynolds. Both women are steeped in acoustic, folk and country traditions. For Lisa it’s a matter of genetics. She began playing fiddle at Cape Breton kitchen parties as a child and turned professional in her mid-teens, wracking up mileage on Celtic roadshows with her brother Ashley, Bruce Guthro and Gordie Sampson, among others. Madviolet spent much of 2004/05 on the road. They toured Canada in support of Worry the Jury both as a duo and with their Toronto-based band (which includes bass player Adrian Lawryshyn and drummer Robin Pirson). They participated in Tom Jackson’s annual Huron Carole fundraising tour on behalf of Canada’s food banks. A third trip was made to Switzerland and they broke ground for the first time in Denmark. And their inaugural trip to Australia was successful enough that they were invited back this February for a tour highlighted by a series of shows at the Tamworth Country Music Festival. Unlike many musicians who roll restlessly from one tour stop to the next, Madviolet are as much travellers as touring artists. Sidestepping the Canadian winter, the self-confessed “freezebags” spent three months exploring Australia last year, documenting their adventures with snakes, sharks, wombats and bike thieves with a videocam. An intended songwriting holiday in Fiji was cut short due to oppressive heat, invasive mosquitoes and near-hallucinogenic kava (Fiji’s ceremonial drink). Instead they headed to Byron Bay, the most easterly point on the Australian continent. John Reynolds, who had encouraged Brenley and Lisa to form Madviolet in 2001, liked their vision of a rootsier sound and invited them back to 18d, his residential studio in Notting Hill. explains Brenley. “There’s always been tension when we’ve recorded with other people, but never, ever with John.” Living in a suite attached to the studio was also a joy for two women who, says Lisa, “love to travel but hate to commute.” After morning runs in Hyde Park with Reynolds’ bull mastiff Marley at their side, the pair would settle into recording sessions punctuated by gourmet meals prepared by the producer himself. (One menu favorite: Jerk cod with garlic, lime and coriander dressing.) Evenings would find a crew of musicians touring the local pubs or, on a couple of occasions, visiting Brian Eno’s apartment for friendly singalongs hosted by the famed composer/producer.